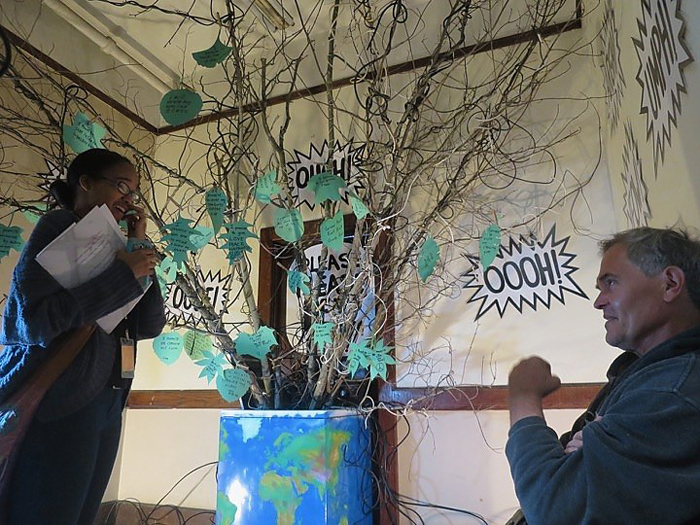 "Helping to Restore the Tree of Life", is an interactive installation by artist Joe Fekieta that invites the viewer to write a promise that helps restore the tree of life. The promises are written on one of 13 different green paper tree leaves which is then hung on a branch with a wooden clothespin. The installation is constructed of eight dead saplings with cable wire encircling the branches. The branches emerge from a washing machine with the planet Earth painted on three sides with a hundred wire cable plugs spreading out from the bottom of the washing machine, symbolizing how wired our planet has become.